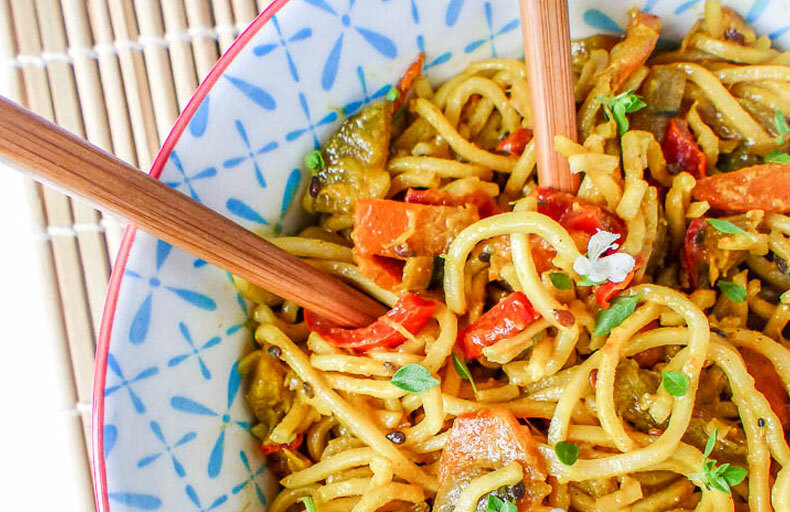 Today, our partner blog Amande Basilic suggests her chinese noodles with crunchy vegetables realized with the Ecomil coco cooking cream, a classic chinese dish! Cook the chinese noodles for 5 minutes in a large quantity of salted boiling water. Then strain and run under cold water. Keeping in the colander. Peel all the vegetables except the zucchini and chop the onion and the mushrooms finely. Slice the carrots, the pepper removed of its seeds and the zucchini in julienne strips. Grate the turmeric and squeeze the garlic clove. In a frying pan or a wok, heat 2 olive oil tablespoons and throw the sesame seeds. Let brown while removing. Add the chopped onion and garlic, color and incorporate all the vegetable, the currym the turmeric and an olive oil spoon. Remove the mix and cook for almost 15 minutes. The vegetables should be cooked but still a bit crunchy. Incorporate the chinese noodles and the coco cream, remove energetically and heat up almost 5 minutes on a medium heat while removing. Serve immediatly and enjoy ! Thank again to Amande Basilic for her exotic recipe created especially for Ecomil! Find all her plant-based recipes in her blog and her instagram ! Vegan Cheesecake with coconut milk and spéculos What would happen if you only eat organic food during 10 days?